I truly believe God has a purpose for all of us. For Pastor Don Piper, his purpose was a lot greater than he had ever initially realized. On that one rainy day, driving home from a conference, little did he know that his life would be forever changed in so many ways. 90 Minutes in Heaven is a New York Times bestseller written by Pastor Don Piper, himself (along with co-writer Cecil Murphey), recounting his true story of life and death. The book was originally released in 2004, and has recently been made into a movie. A brand new edition of the book was also published to celebrate the official theatrical release of the film. I personally had the wonderful privilege of receiving a copy of 90 Minutes in Heaven to read. In the book, 90 Minutes in Heaven, Pastor Don Piper not only tells of his experience in Heaven, but the struggle to get his life back together after the horrific accident. I'm only half way through the book, and I have to say it's really difficult to put down. I'm not only touched by his story and how he overcame (and is still overcoming) his trials and tribulations, but inspired by his strength to push through it all. One of the things that really got me while reading his story was the vast amount of people that stood by him, helping him, and praying for his recovery everyday. What a glorious amount of support he received, even from people whom he only just met. There were times that Piper was ready to give up, but God is always good. He put those people in his life to really help him along each step of the way. Pastor Piper is what many would call a miracle of medical science. After being in the hospital for thirteen months, enduring thirty-four major surgeries, some quite new and experimental at that point in time, and many additional years of painful rehabilitation, he felt it was his calling to witness to others about the miracle of prayer and the many lessons he had learned while dealing with his own tragedies, and of course his experience in Heaven. The film is presented by Giving Films. Starring Hayden Christensen (Star Wars: Episode II - Attack of the Clones, Star Wars: Episode III - Revenge of the Sith), Kate Bosworth (Remember The Titans, Blue Crush) Michael W. Smith, Fred Thompson, Dwight Yoakam, and Jason Kennedy, 90 Minutes In Heaven is based on the inspiring New York Times best-selling book that has sold 7 million copies. In addition to receiving the book, I also got an exclusive sneak peak at the opening scene of the new 90 Minutes in Heaven film, which officially releases everywhere on September 11, 2015. Needless to say, I'm really excited about seeing this movie. For those who are also anticipating the film, but haven't already read Pastor Piper's story, I highly recommend reading his book. 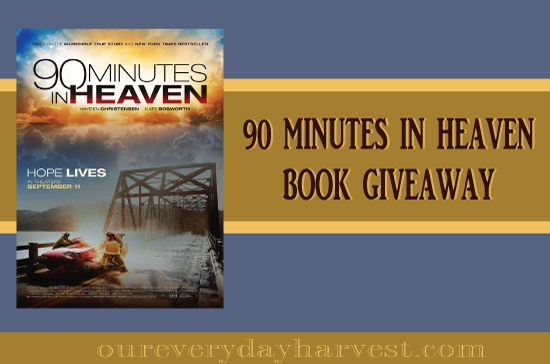 I'm so happy to also announce that I'll be giving one Our Everyday Harvest reader the chance to win a copy of the 90 Minutes in Heaven (Movie Edition) bestselling book, so that they can experience this incredibly moving story for themselves. Only one entrant per mailing address, per giveaway. If you have won a prize from our sponsor Propeller / FlyBy Promotions in the last 30 days, you are not eligible to win. If you have won the same prize on another blog, you are not eligible to win it again.